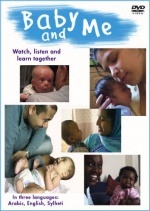 Made with families living within Westminster, London, the film shows people from diverse cultures and backgrounds talking with, playing together, and soothing their babies. There are some wonderful sequences showing new babies and mothers closely mimicking each other. Church Street Sure Start Local Programme Speech and Language Therapist, Liz Lowton, and Family Psychotherapist, Yvonne Bailey Smith, have come together with Clive and Helen Dorman of The Children's Project, to produce this important DVD. * We were approached by an Health Authority in Australia who liked the DVD but have a policy of not promoting bottle feeding. We edited out the sequence and made an English only DVD for them. In reality there is a good back story behind the sequence (which was not needed for the film). The viewer sees a dad bottle feeding his baby. He is feeding her mum's expressed milk in preparation for when mum returns to work and will be unable to breastfeed during the day.